I re-threaded each section spirally, however, this time around, I left a bigger space between each pattern. If you noticed, her hair looks plumper than the previous week, when the spaces were smaller. Usually, I would thread all the ends together because that protects the ends. But this time around, I decided to have the ends hang because the style looks better with ends out. 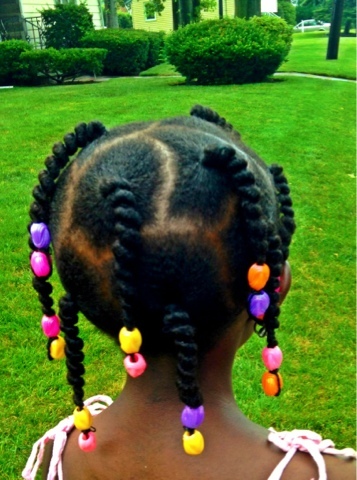 To seal the ends, I decided to use big Beads since the plaits are big. I got them from my local beauty supply store. I finished the ends with extra threads like I normally do. 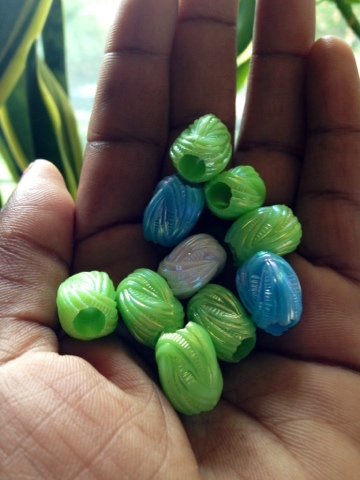 This protects the ends so that they don't get damaged by the knots used to seal the ends and the beads. I also made sure to use rubber bands with a big diameter. 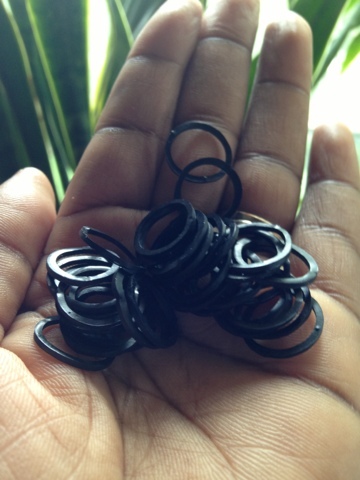 These are easy to pull and snip off when removing the beads to avoid damage to the ends. I don't think this style will last for more than a week but if it still looks good after a week, then I will leave it alone for another week or less. Spray with homemade moisturizer( liquid consistency) once a week. 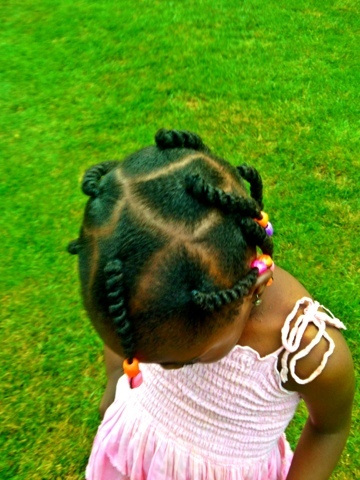 Her hair was heavily moisturized before I styled it. We don't do the daily moisturizing anymore and her hair is doing great. Beautiful! 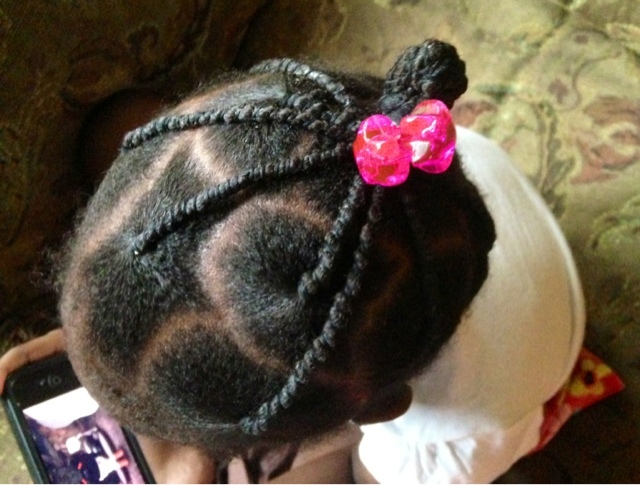 Her hair is so creative and neat! Thanks! Thank Hod for Shea butter. I think it helped with the neatness. This is the cutest! He hair looks amazing. Great job sis! Thanks sis. I love this style on her too. We had to wait for her hair to get full enough for this. Love this style!!! 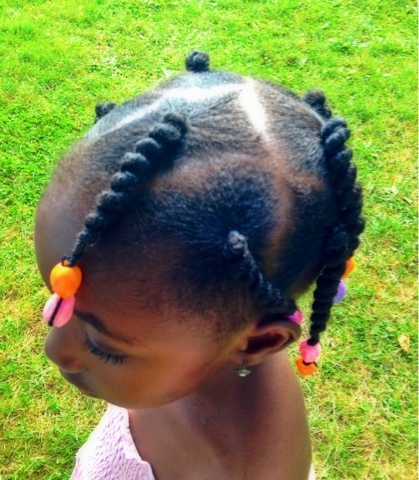 I like threading but so far I only do it to stretch my daughter's hair and she may wear it out for a day because I am horrible at getting the ends to stay (don't want to tie in knots), so I end up with unraveled thread all over the place, lol! Thanks! I know what you mean by "don't want to tie in knots".That's why I add extra threads at the ends which is what I tie the knots on. I think I should do a tutorial on that.